How do I skip deliveries or turn off my newsletter for a period of time? There are some periods throughout the year when maybe you and your organization want to take some time off from sending newsletters (e.g. during the Holidays). No problem! If you're planning on skipping a delivery because you don't want to repeat content: don't worry - that's not an issue either. The only way your subscribers would receive repetitive content is if it were pinned. If you'd just like to skip a single day like a holiday, we've got you covered: There's a convenient feature titled Skip National Holidays. 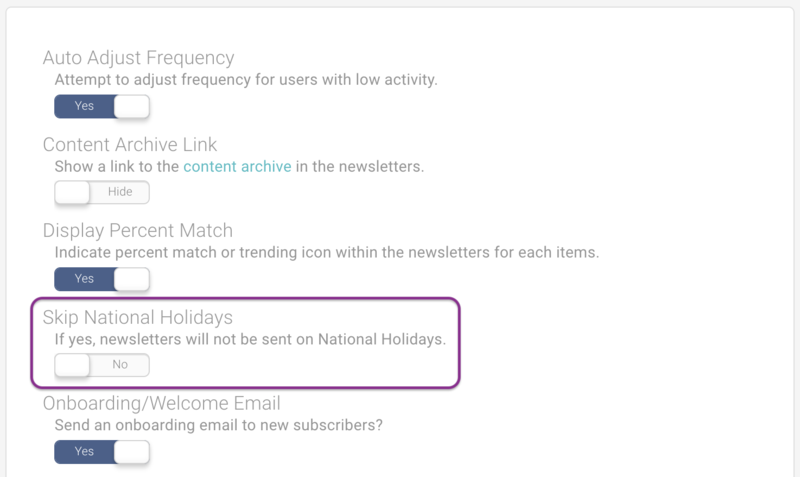 You can find this feature by going to Settings > Automated Email > Other Settings and moving Skip National Holidays to the Yes position. But, some weeks you might not want to send out a newsletter because it's a slow time of the year for your organization. Instead of changing your default settings for one week, we have as simpler solution - switch your Cerkl back to Test Mode. 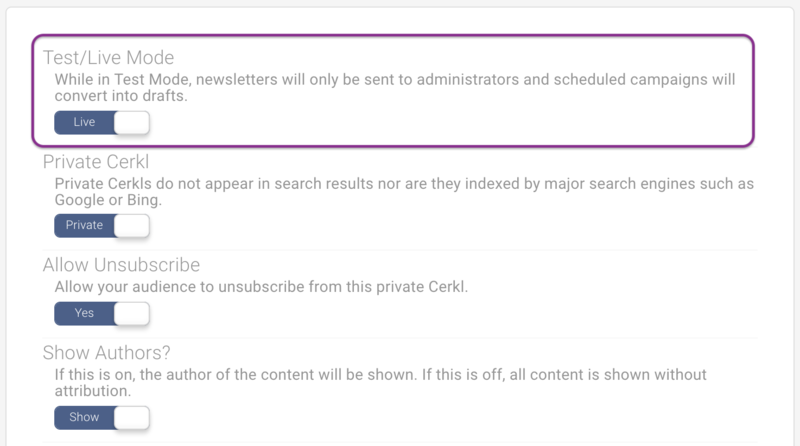 Your Cerkl being in Test Mode means that your subscribers, whether they have a personalized or default delivery time, will not receive any emails whatsoever. To set your Cerkl to Test Mode, go to your organization's Settings > General > Other Settings > Test/Live Mode > toggle to Test.